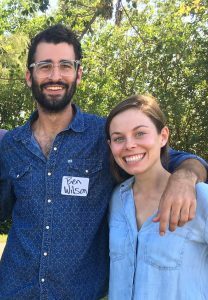 Doctoral candidate Shelby Servais and doctoral graduate Ben Wilson have been selected as Science Policy Fellows through the National Academies of Sciences, Engineering, and Medicine’s Gulf Research Program. Funded by the Deepwater Horizon settlement, the fellowship places scientists with offices in Gulf Coast communities so that they can experience the intersection of science and policy first-hand and learn how science can inform policy and decision-making. Fellows spend one year on the staff of federal, state, local, or non-governmental, natural resource, oil and gas, and public health agencies in the Gulf of Mexico region. Ben and Shelby’s research interests focus on how saltwater intrusion affects plant and soil environments. Shelby’s dissertation investigated how changing environmental conditions affect soil microbes. In the Florida Everglades, she tested how saltwater intrusion alters how soil microbes process carbon nutrients. Ben’s research has focused on how coastal wetlands respond to a changing climate. He has investigated how rising sea levels and saltwater intrusion will affect plant and soil communities. Shelby earned her B.S. in environmental science from Mount Saint Mary’s University and will receive her Ph.D. in biology from FIU in Summer 2018. She conducted the research for her dissertation in the Florida Coastal Everglades Long-Term Ecological Research Network, a network of research programs located at sites that support study on the influence of long-term and large-scale ecological events. Enthusiastic about science outreach, Shelby served as a Science Communication Fellow at the Frost Museum of Science in Miami while completing her graduate program. Shelby will be hosted by the U.S. Fish and Wildlife Service in Fairhope, Alabama during her Science Policy Fellowship. Ben holds a Ph.D. in ecology from FIU and an M.S. in marine biology from the Dauphin Island Sea Lab and University of Alabama. He has received several awards for his research, including Best Dissertation by the FIU College of Arts, Sciences, and Education, the NSF Doctoral Dissertation Improvement Grant, the FIU Dissertation Year Fellowship, and the Ecological Society of America’s Braun Award for Best Student Poster in 2017. Improving science communication beyond an academic audience has been a priority for Ben, a Science Communication Fellow with the Frost Science Museum. He has focused on communicating the importance of coastal ecosystems, as well as the threat that climate change poses to these ecosystems. One of his career goals is to help protect and restore coastal ecosystems by ensuring that research is communicated effectively enough to reach the correct audience and impact environmental policy. Ben will be hosted by the U.S. Fish and Wildlife Service in Lafayette, LA, during his Science Policy Fellowship.